Four weeks from now will see the new consoles available in the UK from Microsoft and Sony. I’m looking forward to seeing what both offer and to wet the appetite both companies have started their advertising blitz. Perfect Day and focuses purely on games and people playing them. It’s a core theme that Sony has been consistent on throughout the year and pushed again with a UK ad to celebrating 20 odd years of the PlayStation. Microsoft focus on the different capabilities of the console. Games first but then watching TV and movies and Skype chats with friends. Much better than their showing at E3. The adverts highlight the clear difference between the two. Sony is all about games and Microsoft is games first but so much more…but more that a lot of people will not be interested in. Despite the missteps from Microsoft over the last few months there really isn’t that much between the two new consoles. If I had to decide based on the adverts above I’d be picking the PS4 as it focuses on the games and for me thats still what a console is all about. Ironically though the first party games on the PlayStation look to be weaker than those on the Xbox and online which is important for me still looks to be better on Xbox. Both adverts also show that Titanfall and Driveclub were both expected to be launch title exclusives that have missed their date. Shame, although for Driveclub it may be a blessing as Forza 5 looks so much better. So four weeks from now I should have an Xbox One and at the moment I’m picking up Fifa and Forza only. I’ll decide on Battlefield or COD nearer the time. At the start of the year I said I wouldn’t be buying a PS4 but I can see that changing over the next 12 months as there are loads of indie games that look to be Playstation only. It’s been a long time since we’ve seen anything new in consoles so it’s great to say there’s less than a month to go. Can’t wait. One of my favourite cartoons is Calvin & Hobbes. Next month a new documentary, Dear Mr Watterson, looks at why Calvin & Hobbes was so successful and the impact it’s had on a generation of readers. Bill Watterson created the strip and stopped publishing in 1995. He is very private and the film seemingly respects that privacy. Looking forward to this. Calvin & Hobbes takes me back to my time at uni. Lewis let me borrow a copy of one of his books and I was hooked. So good. I picked up an Apple TV a few months ago and I’ve got far more use out of it than I expected. The following are some app’s and tricks that I’ve found handy in that time. The sole reason I picked up an Apple TV was PlexConnect. PlexConnect is a hack to allow an Apple TV to playback media from you local Plex library. It works by routing requests from the Apple Trailers app on the Apple TV to your Plex install and sending back results that the Apple TV expects that is really your Plex library. A clever hack but as with all hacks at risk of Apple making changes to disable it in the future. An update a couple of months ago to add new channels changed the trailers app to only work with https. This was enough to break PlexConnect. Bad Apple. A few days passed before a fairly straightforward work around was published that looks worse than it is. Follow the steps and PlexConnect was back up and running. At this point I found some issues with playback – stutters, frame drops. I was convinced that PlexConnect was no more and I would need to move to another solution – Roku or perhaps invest in a Mac Mini. It turns out my network switch was at fault so a swift replacement later saw PlexConnect returned to it’s former glory. I love it, all my movies available on the Apple TV without having to worry about converting to a compatible format. If Plex and PlexConnect seem like hard work but you want the flexibility of playing back any media on your Apple TV without converting to a compatible format then Beamer for Mac is a great option. Install and launch Beamer on your Mac and you are presented with a small window. Drop a movie of any format (AVI, MKV, MOV, MP4, WMV, FLV) on to the window and a few seconds later it will playback on your Apple TV all via Airplay. Like any other movie on the Apple TV you can control playback via the Apple remote and Beamer supports 1080p and also 5.1 surround sound, both Dolby Digital and DTS. Subtitles are also supported. On the movies I tested there was no issue at all. Smooth, quick and great sound. Considering this removes the need to convert films, jailbreak older Apple TV’s or mess around with PlexConnect the £12 cost is trivial. Setting up the Apple TV can be painful. Typing in the wi-fi password is an exercise in frustration with the remote. One shortcut is to use your iOS device. Switch on the Apple TV, connect it to your TV and touch the Apple TV with your iOS device. The Apple TV (once you zap in a password) will then copy wifi settings and automatically configure itself. Smart, and the touch isn’t really necessary as it’s not done via NFC but it’s just Apple’s way of ensuring that you get the iOS device in close enough range for bluetooth to work effectively. If you do have an iOS device, download the Apple Remote and use it to control the Apple TV. It makes for a far better experience and if you’ve used the physical Apple remote to search for music in a large library you will find the iOS version infinitely better. For £99 the Apple TV is good value and I’m getting a lot of use out of it. However I think I’d point people to the Roku 3 that has finally come out in the UK as it offers a lot more for the same money and a store where you can pick up app’s like Plex to further improve the Roku. Hopefully the tips above thought will make for a better Apple TV experience…and maybe one day Apple will bring an App store to it’s TV platform. Chvrches new album is one of the best I’ve heard this year. Lauren Mayberry is their lead singer and writes in the Guardian about the daily abuse she gets from social networks. So sad. That sense of satisfaction as the robotic female voice kicks in and proclaims ‘workout complete’ has become familiar over the last 9 weeks. Using a RunKeeper beginner 5k training program I’ve went from struggling to complete just 1km without collapsing to running 5k’s, not with ease or quickly, but regularly and unexpectedly looking forward to my next run. 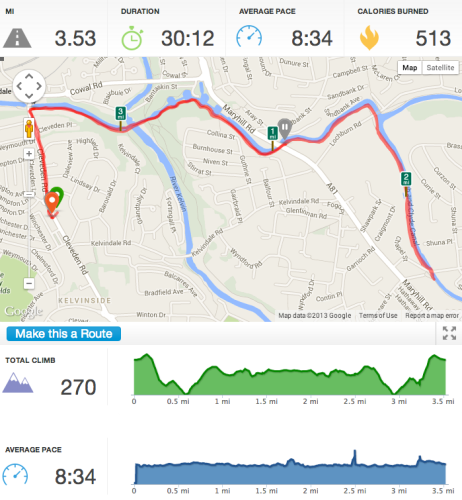 The workout program was excellent as it kept the run’s varied and gradually stepped up pace and distance. I’m actually surprised at some of the distances I managed through the 9 weeks with a couple of 10k runs thrown in to the mix although I did feel the impact on my knee’s and legs the following days. However now that the program has come to an end I am left wondering….what now? The 5k was a target to aim for and I really enjoyed reaching that goal. However I have zero interest in running a 5 or 10k race. Don’t know why but it just doesn’t appeal to me. I do however want to keep on running especially during the autumn and winter months. I can already feel the chill in the air on some of the morning runs, so much so that I popped down to Achilles Heel and picked up some running tights. That’s something I never expected to be buying! I’m sticking with RunKeeper and have selected a fat burning program which I hope has enough variety over the coming weeks to keep me interested. I may also try a parkrun as it’s worked so well for Henry. The aim for the next few weeks is to look at improving my 5k times and keep running regularly which I’m sure will be more challenging as the weather turns but then again, this running lark is weirdly addictive.